University of Sydney Geoscientists have already had some high quality time on Australia’s brand new research vessel! Last week Tom Hubble was out at sea on this exceptional vessel as the Co-Chief Scientist. Tom, and Scott Nicol from Geoscience Australia, were invited to lead a select team of scientists on the one week geoscience trial voyage to test out the RV Investigator’s brand new deep-marine equipment, including the new coring rig, the dredges and the sub-bottom profiling system. They took cores and dredge samples off the coast of Tasmania and as a result intend to submit a collaborative proposal in the next round of applications. Tom and Scott will also be participating in Tim O’Hara’s (Museum Victoria) five week RV Investigator voyage surveying and investigating deep benthic fauna and habitats of the East Australian Seaboard late next year. 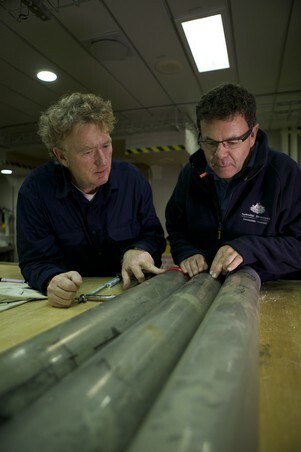 Co-Chief Scientists Tom Hubble and Scott Nichol examining a gravity core taken from the middle continental slope in 3000m water depth offshore the Freycinet Peninsula during the INV2015-E05 cruise. And yes it does have a turbidite sand in it. Also, continuing with all things RV Investigator, earlier this week a few of us from the School of Geosciences were lucky enough to take a tour on board Investigator while it was visiting Sydney. From its position alongside the Royal Australian Navy’s Fleet Base East (HMAS Kuttabul) in Woolloomooloo, we were able to board the vessel and take a look around at this amazing new addition to Australia’s scientific arsenal! Two words: very impressive!! To check out more about the ship, visit the CSIRO website.